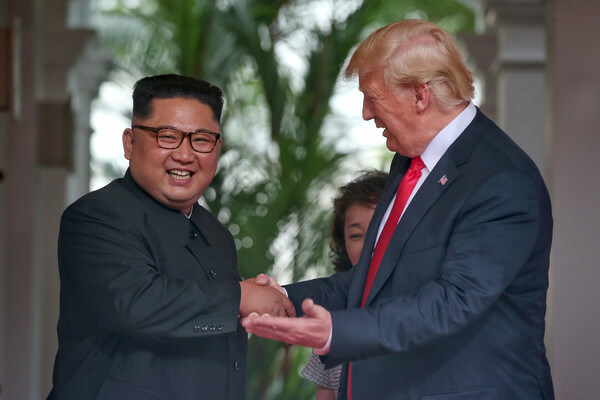 SINGAPORE, June 12 (Reuters) – North Korean leader Kim Jong Un and U.S. President Donald Trump shook hands and smiled cautiously as they met at their historic summit in Singapore on Tuesday, in which the two men will look for ways to end a nuclear standoff on the Korean peninsula. “Nice to meet you Mister President,” Kim said as he sat alongside Trump, against a backdrop of North Korean and U.S. flags, beaming broadly as the U.S. president gave him a thumbs up. Trump said he was sure they would have a “terrific relationship”. Both men looked serious as they got out of their limousines for the summit at the Capella hotel on Singapore’s Sentosa, a resort island with luxury hotels, a casino, manmade beaches and a Universal Studios theme park. After some initial exchanges lasting around half-an-hour, Trump and Kim emerged, walking side-by-side through the colonnaded hotel before re-entering the meeting room, where they were joined by their most senior officials. In the hours before the summit began, Trump expressed optimism about prospects for the first-ever meeting of sitting U.S. and North Korean leaders, while U.S. Secretary of State Mike Pompeo injected a note of caution whether Kim would prove to be sincere about his willingness to denuclearise. Trump spoke to both South Korean President Moon Jae-in and Japan’s Prime Minister Shinzo Abe on Monday to discuss developments ahead of the summit. For Kim, the authoritarian leader of a militarised state that has shunned contact with the outside world, the ultimate goal aside from security guarantees would be freedom and support to develop an impoverished economy. For Trump, achieving a momentous foreign policy success would cement his place in history. Many experts on North Korea remain sceptical Kim will ever completely abandon nuclear weapons, believing his engagement aims to get the United States to ease crippling sanctions.